The Vanguard Alta Pro is a full-sized tripod with excellent versatility and top-notch durability. The Vanguard Alta Pro 263AB is an excellent full-sized tripod for the studio photographer. With an ultra-sturdy build, plenty of angle options, and some subtle components that make it easier to set up and break down, this tripod will fit right into a studio setup. We wouldn’t put this in the travel-friendly category since it won’t fit easily into a travel bag, but the sturdiness of the construction, the big, easy-to-operate components, and the high weight capacity make it a great main tripod for video or photo shoots. The entire Vanguard line of tripods sport the same general look and feel: a mostly black construction with slick metallic silver accents and some bright orange touches on the secondary switches. The 263AB looks and feels every bit as professional as you’d expect from a Vanguard tripod. Each of the main legs is 22 inches long when folded up, and about 0.5 inches thick at their widest. The center pole has a hexagonal design, which differentiates it nicely from the curved main legs. The aluminum sports an all matte black, brushed aluminum surface, which looks really sleek. All in all, the design of this tripod matches anything a modern photographer would be looking for, even if the orange touches do give it a bit of a sportier character. Check out our guide to taking pictures with a tripod. With tripods that are this multifunctional, there’s a bit of a learning curve. With all the knobs, switches and levers, the 263AB was no exception. We’ll start at the top and work our way down. The top plate that holds the camera pops in and out with a small spring-loaded button, which we found to be just passable as far as a quick-release mechanism goes. There are two levels on the top that allow for perfectly straight shots. The main pivot on the mount mechanism is the SBH-100 ball head which we found have among the smoothest movements on any tripods we’ve tested. The center hexagonal rod provides even more versatility because it extends up to its full height of over 68 inches, or folds fully down. You can even pivot it up to 180 degrees for more slanted angles. Finally, the three legs of the tripod can extend to 56 inches with their two telescoping sections, and they can be pivoted outward in really intuitive locking angles of 25, 50, and 80 degrees. These locking pivot points are activated and changed with a firm press of the silver locking button at the top of each leg. The main pivot on the mount mechanism is the SBH-100 ball head which we found to be among the smoothest movements on any tripods we’ve tested. The knobs and buttons are placed very intuitively within about six inches of all the top camera attachments and controls, which mean that it’s very easy to quickly adjust any of the above functionality while you’re shooting. Vanguard is known as a brand that sells both photography accessories as well as nature, hiking, and hunting accessories. As such, it’s not surprising to see that the 263AB feels rugged. From the aluminum alloy that makes up much of the construction, to the die-cast magnesium alloy that bolsters some of the joints and components, the tripod is premium. Even the plastic components—things like the leg telescoping clasps and the rubber-coated tightening knobs—feel like they’d last a long time. The 263AB looks and feels every bit as professional as you’d expect from a Vanguard tripod. This premium build quality does come at a cost: the whole unit weighs roughly 5.4 pounds, which is on the heavier side of the tripods we tested. This means that it will be very difficult to bring it along on your remote shoots as a travel tripod—a fact that is further underscored by how big it is, even folded up. On the plus side, the construction promises a max weight capacity of 15.4 pounds, which means that basically any brand of DSLR will be supported. All of this means that the Alta Pro is better suited for use in a studio than it is as a travel tripod. Check out our DSLR camera maintenance guide. The Alta Pro is designed to be the single main tool for working photographers. 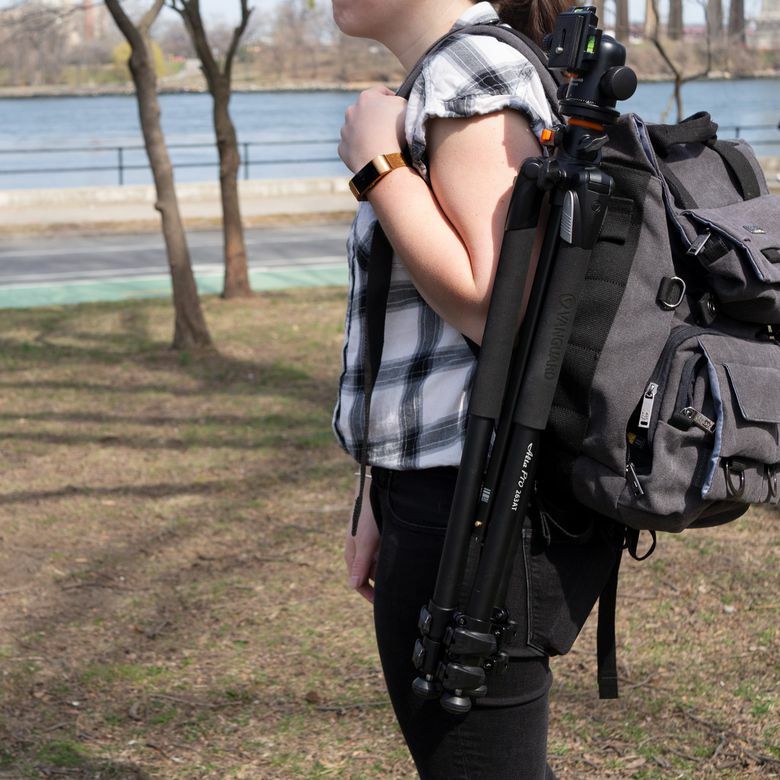 It comes with a thick, heavy-duty carrying bag with a strap is a good deal bigger and more comfortable than many of the smaller travel tripod bags. The bag opens and close from the top with a drawstring, instead of a full-length zipper, which isn’t the best in our opinion, because it’s harder to get the tripod out. There’s also the quick-release camera plate, and Vanguard does also include an Allen wrench for adjusting some of the fine-tuning mechanisms throughout the unit. On the Vanguard website, the Alta Pro costs just under $200, which puts it at the higher end of the tripods they offer. You can regularly pick this up on Amazon for about $130, which is a much better price for this tripod, in our opinion. Many of the higher-end travel tripods cost closer to $200, so to have such a substantially built tripod as your main studio unit for $130, is great. Also, when you factor in the 2-year included warranty, with the option for a 10-year extended warranty, the value becomes even better. If you’re looking for a main studio tripod you can rely on for all of your shoots, the Alta Pro is a good bet. Alta Pro 263AP: There are a lot of versions of the 263 line, and in our opinion, the closest competition is the 263AP with its extended video panning handle near the top. It all comes down to what your preferred method of angle pivoting is. Manfrotto 290 Dual: For about double the price, you can get a more substantial and more full-featured tripod from Manfrotto, but you don’t get enough new features for this price increase. AmazonBasics Tripods: If price is your top priority, we recommend going for the surprisingly high-quality Amazon Basics tripod for roughly a fifth of the cost. The Alta Pro was one of the biggest tripods we tested, and for the most part, it checks every box. The 360-degree ball head is among the smoothest we’ve used, the thick, telescoping legs are very rugged, and very strong, and there’s a ton of versatility on angle choices. It is a bit on the heavy side, but if you’re looking for a main studio tripod you can rely on for all of your shoots, the Alta Pro is a good bet. Product Dimensions 30.7 x 5.1 x 4.7 in.